Today, listening to a podcase of a Big Ideas programme from Australia's ABC Radio National entitled Mary Beard's ancient Rome (audio download, but not transcript) I was amazed to learn that there is a tombstone in northern England dating from Roman times with an inscription that is partly in Latin and partly in Aramaic. The woman in the tomb was apparently from southern England while her husband was a speaker of Aramaic from Palmyra in what is now Syria. More on this remarkable tombstone here. Like professor Beard, I find this utterly amazing. One wonders if there were any other speakers of Aramaic in the area at the time to give the man some mother-tongue company. Again like professor Beard, one also cannot help wondering what language the couple used in their daily life. 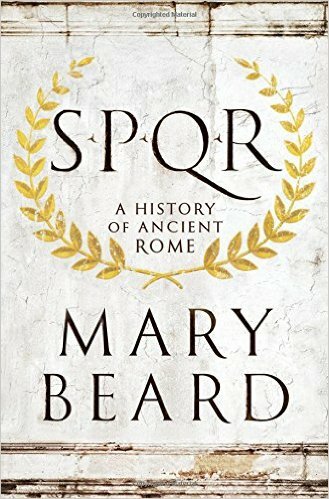 Professor Beard's book is called SPQR: A History of Ancient Rome (link is to a review in The Atlantic). The Senate and People of Rome on a modern-day manhole cover in Rome. On Aramaic, I have wondered in what language Pontius Pilate conversed with Jesus Christ. As a Roman official from Italy, he would have known Latin but likely spoke Greek. The famous Pilate Stone is inscribed in Latin, but who knows whether he really said "Ecce homo" in those words? He was in office in Judaea for a decade, so he might have picked up Aramaic, which was probably Christ's first language. Or was there an interpreter?